A higher form of intelligence. A pure expression of independence. Has it really been 15 years since the debut of the original 718 Boxster? An instant design classic, a powerful mid-engined sports car, a purebred roadster. 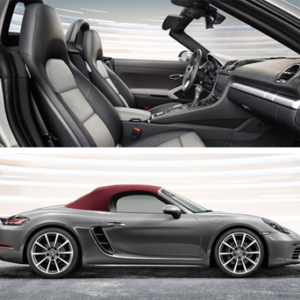 It was clear the Boxster did full justice to its predecessors in the Porsche lineage. 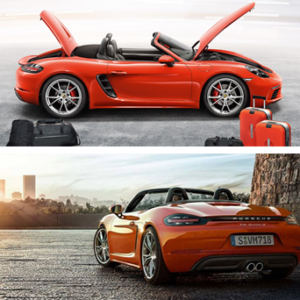 As Porsche engineers planned the third generation Porsche Boxster, the question was, how could it continue to do so in the future? 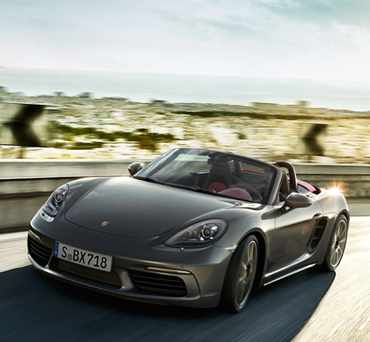 How could the Boxster evolve into something even more evocative of the essence of Porsche performance? 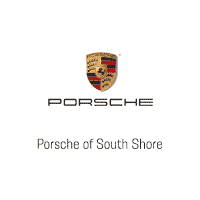 The answer was found where it always is at Porsche: in the harmonious blending of style, functionality, and innovation. 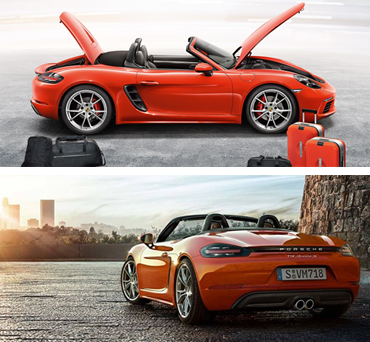 The new Porsche 718 Boxster is nothing less than the total refinement of Porsche’s belief of what a roadster should be, honed and sharpened to give it a completely new expression.We achieved this with Intelligent Performance. With increased power that is delivered more efficiently. With innovative technologies, the strategic use of lightweight materials in its construction, and with an exterior and interior design that puts aesthetically appealing lines and curves in all the right places. 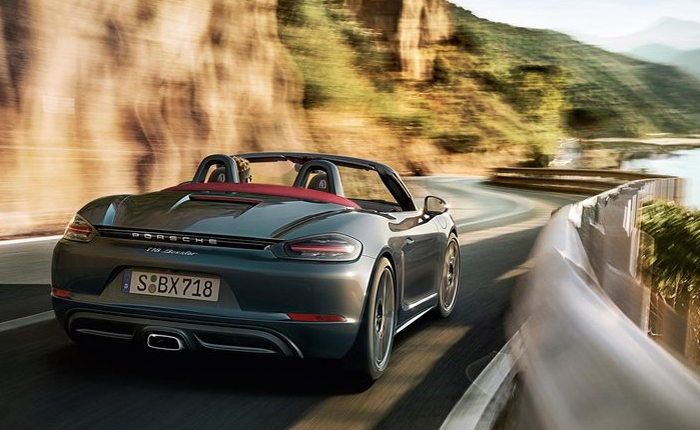 More independent of spirit than ever before, the Porsche 718 Boxster is now even more powerful, visceral, and intense. 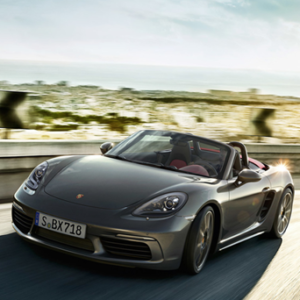 The new Porsche Boxster is the sequel that continues the 718 era. At their heart, a four-cylinder turbocharged boxer engine beats with the same fighting spirit that delivered countless podium finishes. In them lives the will to break away from standards. And to inspire conviction. So it is entirely appropriate that they, too, should bear these three digits in their name and carry the 718 legend forward. Could have, should have, would have. Life’s too short for ‘what ifs’. Too short for unfulfilled daydreams. 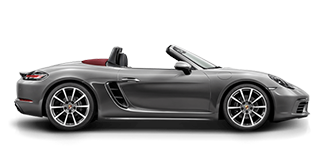 The new Porsche 718 Boxster makes a clear statement: let’s go! 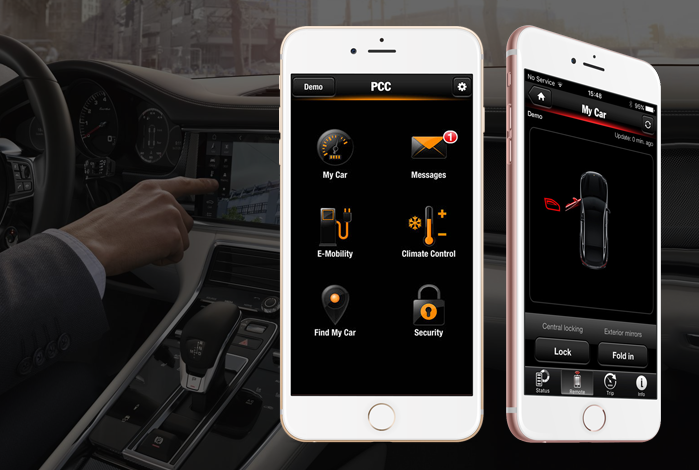 The Connect Plus module ensures maximum connectivity in your Porsche. It features an built-in LTE module with a SIM card slot for an excellent wireless Internet access point which gives you in-car online access from WLAN-enabled client devices (e.g. laptops, tablets or smartphones), simultaneously if necessary. 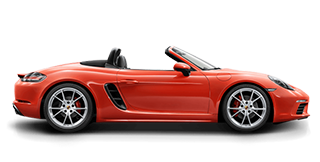 In elevating expectations of how the Boxster should perform, Porsche has once again succeeded in creating an icon of automotive design. It is a Porsche that continues to epitomize the feeling of power inits most efficient form, of pleasure heightened by functional excellence. 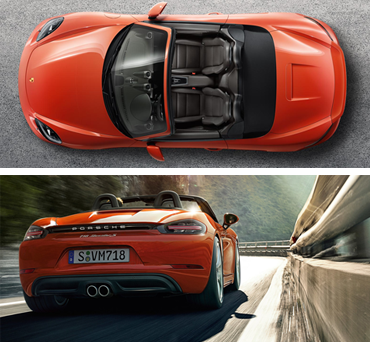 The vertical contour of the headlights was inherited from Porsche race cars of the 1960's and 1970's. 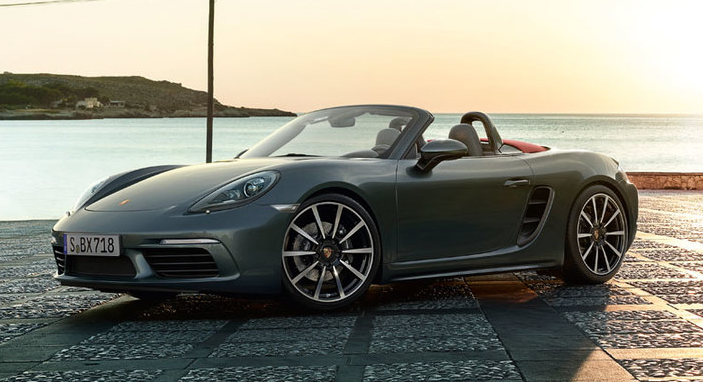 The new Boxster may be infused with the genes of past generations, but it ushers in anew and forward-looking design ethos. Large air intakes give the front a powerful appearance, while the side contour hints at the performance within.The long wheelbase and low, raked windshield are integral to forming the stretched, wedge-shaped silhouette. With the top up, this impression is reinforced by the extreme roofline. 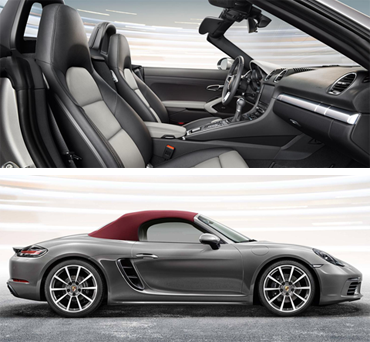 Large wheels, up to 20 inches in size,emphasize the Boxster’s wide track and help to achieve a completely new level of athletic performance.The distinctive shoulder lines give further emphasis to the wheels,which, in combination with the side air intakes and the mid-engine layout,are reminiscent of the 718 RS 60 Spyder, a lightweight mid-engined Porsche from the 1960's that achieved remarkable success in endurance racing and hill-climbing championships. The precise lines are more sharply defined than on any previous Porsche design, and run elegantly across the fenders to the rear. 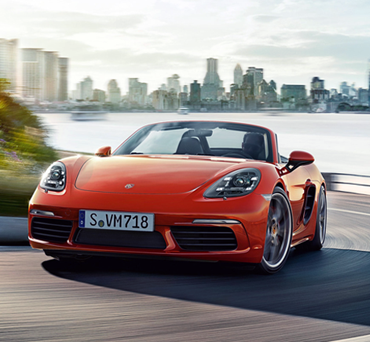 It’s an imposing look that makes the new Boxster unique among other Porsche models. 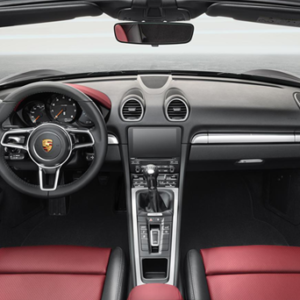 The interior of the new Boxster delivers exactly what the exterior promises—a light, uncluttered, and defined design, existing to fulfill one single aim: the perfect drive.The entire concept—from the power and contour to the driver’s vision—are all drawn in the direction of travel. The Boxster driver’s concentration is kept purely on the road, thanks to the intelligent operating concept and the logical arrangement of the controls. The elevated center console cocoons the driver and reduces the distance from the steering wheel to the shift lever for fast and ergonomic gear shifts. 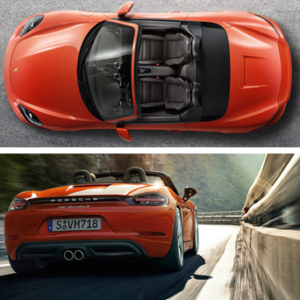 It’s just one of many ways that Porsche transfers its experience from the racetrack to the road.The door styling is similarly dynamic. 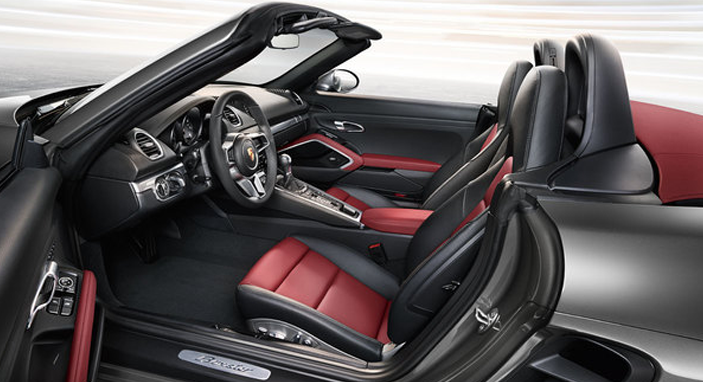 The door pulls mirror the lines of the center console and blend seamlessly into the overall design.The door storage compartments are sweeping and practical.The athletic proportions of the new Boxster models make it possible to introduce a new interior architecture. The driver’s seating position is low, and from that vantage point, there is a feeling of space and light without compromising the authentic roadster experience. Ready to assert your independence? 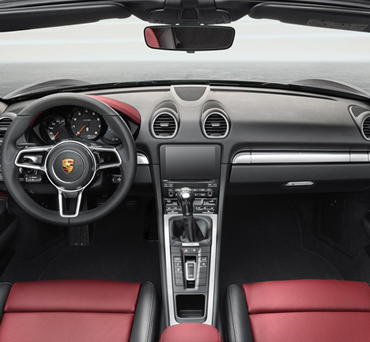 You’ll find the ignition located to the left of the steering column, reflecting Porsche’s racing heritage. The three spoke sport steering wheel fits perfectly in your hands. Facing the driver is a cluster of three large circular instruments. The instrument on the right is now a 4.6-inch TFT screen that shows information from the on-board computer or information from the audio system. An inconspicuous shroud shades the instruments for optimal visibility. The steering wheel rim, shifter lever/gear selector, and door-pull inlays are finished in tactile leather. Silver colored details add to the refined tone.These include the instrument cluster trim strip, the side and center air-vent surrounds, and the center console.